Summary of today’s show: For three years, Fr. Israel Rodriguez has been the first and only priest ordained from Redemptoris Mater Archdiocesan Missionary Seminary, but this weekend he will be joined by Felipe Gonzalez. Scot Landry and Fr. Matt Williams talk with Fr. Israel, as well as Fr. 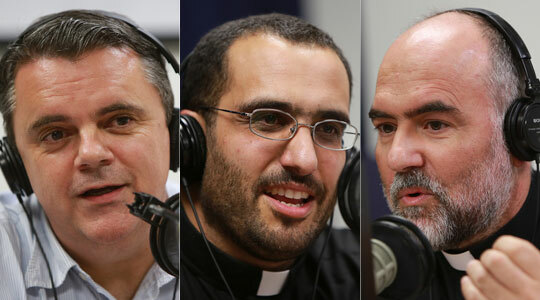 Tony Medeiros and Tom Noe, about the Seminary and the NeoCatechumenal Way, the ecclesial movement that is the spiritual engine of the seminary, as well as the missionary focus of the group that sends fired-up Catholics door-to-door in their neighborhood and around the world to share the Good News of Jesus Christ. Fr. Tony also reveals that the honoree at this year’s gala fundraising dinner for the seminary this Sunday will be the internationally renowned Rabbi David Rosen. 1st segment: Scot welcomed everyone to the show and noted that there are two big events in the Archdiocese this weekend. The ordination Mass is Saturday and the big gala dinner to benefit Redemptoris Mater Seminary is Sunday. Scot said Fr. Matt hasn’t been on the show in a while so he and Scot caught up. He said the Office for the New Evangelization of Youth and Young Adults is planning for the Middle School Harbor Cruise coming up as well as the Middle School and High School leadership retreats coming up this summer. He suggested people check out the office’s website. Scot noted that Deacon Eric Cadin who will be ordained this weekend will celebrate his first Mass at the Life Teen Mass at St. Mary’s Parish in Dedham, the Mass Fr. Matt celebrated for several years. He said youth ministry enervates the priest and his priesthood. He also said having a newly ordained priest there can be the nudge for a young man to consider the priesthood. Fr. Matt said they have had many seminarians assigned to the parish over the years, which is a twofold blessing for both the seminarian and for the young people, who are encouraged to consider their own vocations from God. 2nd segment: Scot and Fr. Matt welcomed Fr. Tony Medeiros, rector of Redemptoris Mater Seminary; Tom Noe, who is coordinator of the Neocatechumenal Way in the archdiocese. Tom said he grew up in Stoughton and works at St. Patrick’s in Brockton. Also he welcomed Fr. Israel Rodriguez, who was the first priest ordained from Redemptoris Mater. He said his first assignment was in Immaculate Conception in Marlborough, which was a trilingual parish—English, Spanish, and Portuguese. Then he was transferred to St. Patrick’s in Lawrence, a large parish with a large Hispanic population. Fr. Israel is from Granada, Spain, and is one of 12 children in his family. Scot said many of the priests from Redemptoris Mater Seminary serve worldwide and come from the Neocatechumenal Way. Fr. Tony said there are 86 Redemptoris Mater seminaries around the world. They are preparing almost 3,000 men. In Boston, they have 20 men, 15 in the house and 5 in mission, from 11 different countries. Fr. Matt asked about the Neocatechumenal Way. Tom said it started around the start of the Second Vatican Council with a Spanish artist, Kiko Arguello, who gathered others around him who were searching for truth. He found the answer in the Church. Fr. Tony noted that when John Paul II was a very young priest in 1947, he wrote a theological treatise on the importance of the catechumen ate for the 20th century. He had seen the effects of atheistic communism trying to wipe out the faith and saw how a return to the way of the early Church in initiating into the faith would combat that. Scot said one of things distinctive about the NeoCatechumenal Way forms people not just in their faith, but also forms them to be missionaries. Tom said one enters the community, there’s no expectations put on you. Most people are looking for answers. What’s important is Word, Liturgy, and Community. This is the basis of the NeoCatechumenal Way. This is lived out in small communities, because you can only really get to know people intimately in a small group. The Word of God is proclaimed and prepared by a member of the community who talks about what the Word means to them, but after an official presentation by the priest. They also have particularly intimate experiences of the faith. Tom said it happens in such a way that people’s lives start to change. He recounted the story of his own marriage, where he and his wife were nominal Catholics at the time of their marriage ended up having a crisis in their marriage. At that time, they were told that the answers they were looking for would be found in Christ. They start going to the catechesis, then entered the community. Scot asked Fr. Tony about the blending of diocesan priesthood with missionary zeal. Fr. Tony said all the men in the seminary are ordained as diocesan priests, but they still have the idea of being sent out by the Lord into the world. This sense is strongly ingrained in the Way, including in the laypeople. All of these men have to be willing to go where the Cardinal sends them. Perhaps in the future, they could be sent somewhere else in the world to minister at the Cardinal’s request, like in the Society of St. James. Scot asked Fr. Israel how this missionary heart enters into the way he serves as a priest. Fr. Israel said anyplace can be a mission. He looks around at the families, the problems, especially in Lawrence. He began to visit families, going door to door, sometimes accompanied by seminarians or sacristans. People are grateful to see the priest to give a word of encouragement or hope, even if they don’t go to church. The fact that the Church is looking for the lost sheep is a sign of love. Many people will come back or even just start a conversation about baptizing children or the like. He finds a lot of joy in that kind of mission in the streets. This Saturday, Fr. Israel will have Fr. Felipe Gonzalez join him as another priest ordained from Redemptoris Mater. Felipe had served 4 years on mission in India and Pakistan and other places. He’s very down-to-earth said Fr. Israel. Fr. Tony said Felipe comes from California where he grew up. He said Felipe’s experiences have all prepared him for this ministry. Fr. Matt asked if Felipe visiting the foreign missions was part of his seminary. Fr. Tony said it is part of the seminary formation. Felipe started his seminary formation that the seminary in London, then went on his itinerancy for four years and then he was sent to Boston to provide maturity and experience to the men in formation here. Fr. Tony said at the second year of theology, the men are pulled out of St. John Seminary, where they are doing their academics, and sent to the missions where they serve with a priest and an itinerant family for three or four years. Fr. Matt asked how they and the families are prepared to be sent out on itinerancy. Fr. Tony said it is the Way. the seminaries are a shoot from the tree of the Way, which is a school for the missions, in whatever way they will live it out. Sometimes it is local and door to door and other times it is going very far away. The door-to-door ministry provides a presence and visibility in the community, where people begin to look for and ask for them. Tom said the the Way teaches them to be Christian, to have inside of you Christ’s victory over death. The Church announces the Good News that death is overcome, and they bring this with them into the world. The members of the Way are given a formation in Scripture and Catechism to be able to share it. Eventually at one point some members of the community are identified as catechism, who are people who show evidence of a particular ability and charism for sharing the faith. When identified, they can be sent as part of a team to another parish to found a community there. Scot asked Fr. Israel what it’s like to go thousands of miles away from his home to place he’s never been to serve potentially for the rest of his life. Fr. Israel said it’s like a wonderful adventure. Wherever you are, you set down roots. Scot asked Tom how the Way helps celebrate the ordination of one of their own. Tom said they are already part of a NeoCatechumenal Way community. Felipe is part of a community in Framingham and they are providing all kinds of logistical support, to take care of Felipe and his family coming into town this weekend. Scot said the Ordination Mass will be at the Cathedral of the Holy Cross this Saturday at 9am. She wins 2 items for children: A Glory Stories CD: “Be Not Afraid, the Story of Blessed John Paul II” and the “Gospel Champions” computer game. 4th segment: Scot said big way to fund the operations of Redemptoris Mater Seminary is the upcoming Gala Dinner. It is the third annual dinner. Fr. Tony said it’s the main annual fundraiser for the seminary. In the first year they honored Cardinal Sean and John McNeice. Last year, they honored Archbishop Pietro Sambi, the late apostolic nuncio who passed away just a month later after the event. They also recognized Jack Shaughnessy. Shaugnessy and McNeice have been big supporters of the seminary. Scot said Cardinal Sean has a missionary heart. Fr. Tony told the story of meeting Bishop Sean when he was bishop of Fall River and learning of the missionary heart of the Cardinal. He has the heart of a shepherd who has been assigned a portion of the flock and serves them in that place. Scot said both Pope Benedict and Pope John Paul II have both been very big supporters of these new ecclesial movements within the Church. Fr. Tony said it’s an expression of the teaching of the Second Vatican Council which continues to unfold. Scot asked who this year’s honoree is. Fr. Tony said they invited Rabbi David Rosen, one of the most prominent rabbis in the world who lives in Israel. He’s director of inter religious dialogue for the AJC. He’s most famous for his role as head of the commission of diplomats which negotiated full diplomatic relations with the Holy See. He was very close to Pope John Paul II and Pope Benedict XVI. One of the great gifts of the Council to the Church is the renewal of the centrality of the Word of God to faith. After the Reformation, the pendulum swung to highlighting the importance of the sacraments to detriment of the Word of God. Now the Second Vatican Council brought the emphasis back to Scripture. He hopes that Rabbi Rosen’s visit and the inter religious dialogue, it will encourage Catholics to re-discover the Jewish roots of our Catholic faith. Fr. Tony said both Israel and the fathers of the Council have come to understand that the Church has a mission in the world, to serve humanity through what we have inherited.